Dooster’s powerful permission levels are one of its strongest and most unique features. 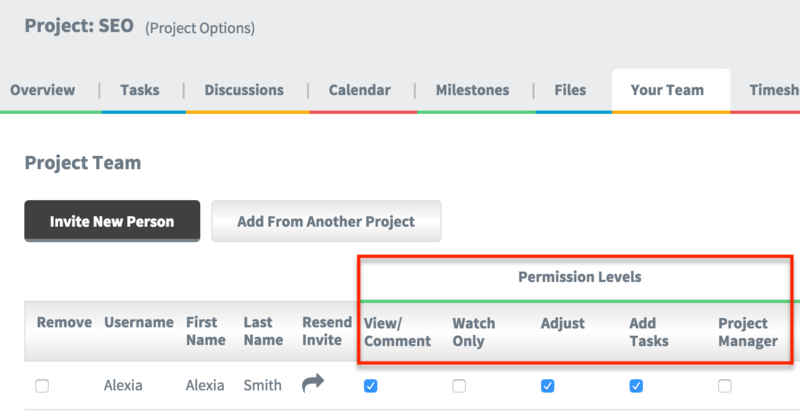 In each project, every Team Member can be set an access / permission level. This controls what they can or cannot see in that project. The Team Member can see tasks that have been assigned to them. They can also see tasks assigned to “anyone” in a project (because they too are “anyone”). They cannot edit / change any task. They cannot create a new task. They cannot see those tasks specifically assigned to other people. Tick to have this Team Member automatically watch EVERY task in this project. This would suit a client. (You can opt to allow this for only some tasks – see “Task Watchers” below **). They will see every task and get any comments and notifications on them. They cannot edit / change the task, (They would need to have at least ‘Edit Tasks’ or higher – permission level). Note: You can set this option in the projects people screen after you’ve added a new person. Or use the “Task Watchers” setting in the Task pop up if you prefer to allow this for only some tasks. AND they can also make changes to them… and add comments. They can attach files to the tasks. They can assign tasks to exisiting members of the project. They cannot adjust member’s permissions. Note: there can be several Project Managers in a project. They can see everything in the project…. can add people… adjust their permissions… and can see every task and file. They cannot see what’s going on in other projects. They can only see tasks in other projects depending on the permission level for THAT project. ** You can also make people “TASK WATCHERS“. This means they can monitor a particular task’s progress. (This can be set by default to Watch Only – see above). *NOTE: Permission levels can be varied for each project. Are not involved at all in Project C.
TIP: To see for yourself how powerful your permissions feature can be, open separate browsers – for example Chrome and Firefox. Log in as a different user on each and you’ll quickly see the differing views the users have of the same project.